As promised long ago, here are some gansey alphabet charts, for anyone wishing to knit initials. These are 15 rounds deep. I prefer a serif. Some motifs are solid, some in moss (seed) stitch. These are solid. Spacing here is arbitrary – decide what looks good to you, when planning your gansey. Clickable PDFs proved problematic for some, so I have loaded these as images. Not all quite the same size, but workable! Click on these to enlarge. There are many alphabets available and these are not based on anything particularly traditional. Or untraditional. You can invent a little spacer motif between initials as well, if wanted. You can put initials wherever you like; front or back; above the welt or even in the underarm gusset (If you could make it fit there!) 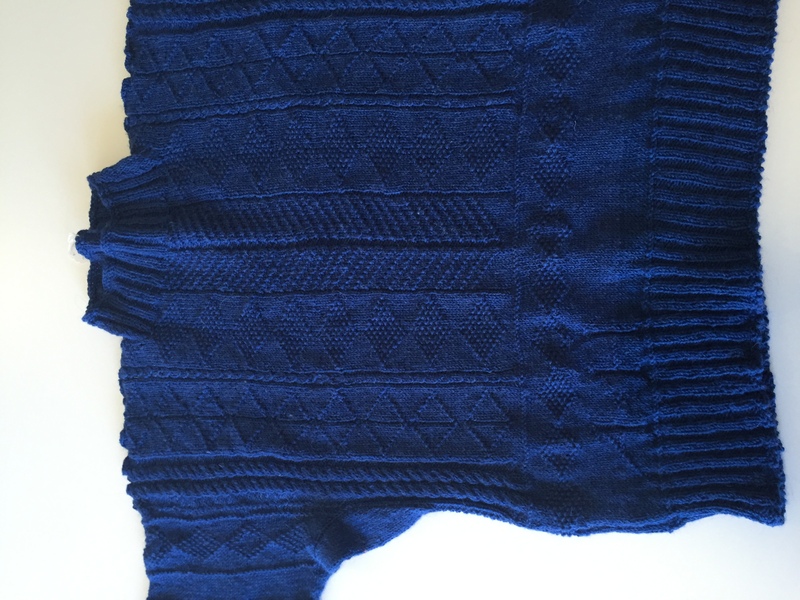 I’ve also seen mention of ganseys with an entire name knitted into them – although not yet seen one in person. The way I do it is to work about 3 plain rounds above the welt, then I start to place the alphabet – usually with a spacer, placed centrally between the two letters – on the front of the gansey, at the left. Then I finish with a roughly equal section of plain stocking stitch – say 3 rounds above the initials, before I start the body’s pattern. This is by no means the ‘best’ or the one true way to do this, just I’m a creature of habit and people do ask from time to time, where to place their initials. Although there is no evidence for dead mariners being identified by ganseys’ motifs or initials – there is some evidence for the initials helping return a gansey to its rightful owner, if it was stolen. In ‘Cornish Guernseys & Knit-frocks’, (1979), Mary Wright describes interviewing Jim Honey at Port Isaac who described what happened when his uncle lost his gansey, knitted by his grandmother. And anyway, let’s face it, who needs to identify a loved one by initials on a garment that might peel off in the water …. That’s why sailors had tattoos, wasn’t it?